S M Ong: PCK promoting graciousness on MRT? In Singlish? PCK promoting graciousness on MRT? In Singlish? 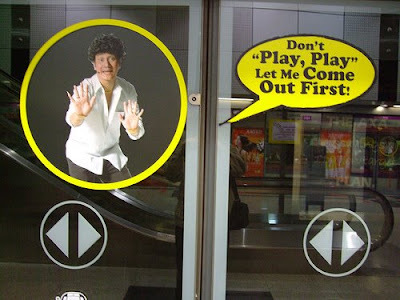 So here I am at an underground MRT station, waiting for the train and staring at the cut-out of Phua Chu Kang pasted on the glass door. Out of what? The closet? This new Land Transport Authority (LTA) campaign using Singapore’s most famous Ah Beng contractor is problematic on several levels. For one thing, it gives me the impression that I should let PCK come out of the train first. But what if PCK isn’t on the train? What do I do then? Which brings me to another issue – why would PCK be on the train in the first place? He is not a real person. How can a fictional character take the train? Would he be using an imaginary ez-link card? Okay, let’s say, for the sake of argument and whimsy, PCK is an actual person and not Gurmit Singh wearing a wig and a fake mole. 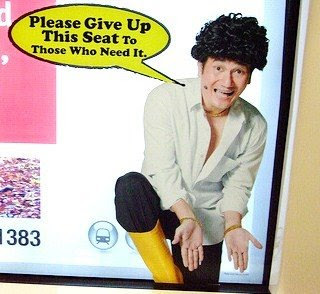 I was the executive producer of Phua Chu Kang Pte Ltd the sitcom for two seasons and I’ve never known PCK or his family to take the MRT or any other public transport apart from a cab. I don’t think the characters have even heard of the ez-link card. PCK drives a Mercedes Benz and his wife Rosie is a taxi-taking tai-tai. But if the two of them were somehow forced to take the train, they would be first to rush like bulldozers for the seats – old folks, pregnant women and crippled old pregnant folks be damned. Which brings me to another issue. Knowing how kiasu the make-believe Beng is, how can I possibly believe PCK when he urges passengers to not “cut queue” and “be gracious” in the LTA-produced rip-off of the PCK Sars rap video? It’s like getting Under One Roof’s Tan Ah Teck to advocate a moderate diet and regular exercise. Or me to promote skincare. There’s simply no credibility. Didn’t LTA learn anything from a similar abortive MRT campaign starring the unholy trinity of crass – Jack Neo, Mark Lee and Patricia Mok – a few years ago? Hasn’t SMRT gone down-market enough when it replaced the classy Juanita Melson as the voice making the train announcements with some bimbo who stresses the wrong syllable in “Clementi”? Isn’t “Don’t play, play” Singlish? Did I send PCK to attend BEST English classes a decade ago as instructed by then-PM Goh Chok Tong for nought? The train arrives and the door opens. I wait for the passengers to alight before boarding. Just as I suspected – PCK not on the train. Why doesn't this recession feel like a recession?